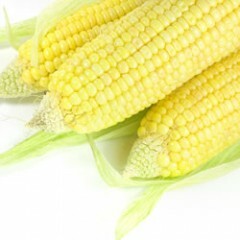 Sweet corn is popular with consumers and growers alike. New York typically ranks in the top 5 producing states with over 19,000 acres of fresh market (2014 Vegetable Summary) and approximately 10,000 acres of processed product grown annually. A range of varieties are available to cover the growing season and needs of each market. Fresh market corn may be planted in March under plastic or later on bare ground. Planting of processing sweet corn in New York begins around May 1st with varieties selected to maintain a steady supply into mid-September. Cornell Cooperative Extension Educators and Cornell faculty work together annually to conduct research on many aspects of sweet corn production in the state. Below you will find educational information and results of our research trials. Learn more about the on-farm evaluations of new tools -- chemical control, air dancers, scare-eye balloons, and detasseling -- for managing bird damage in sweet corn fields conducted by the CCE Cornell Vegetable Program in 2017 in this video and newly released final report.